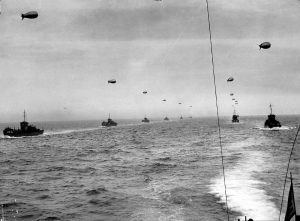 22,442 soldiers, sailors and airmen from Britain and more than 30 Allied nations gave their lives on D-Day and during the Battle of Normandy whilst serving with British units. 25 year old Lieutenant James Samuel Cartwright was one of them. James grew up in Pleasant Point, Canterbury in New Zealand. He became a teacher at St Andrew’s College in Christchurch, which has kindly given us permission to use the images below. As a young man in the 1930’s he was known as an exceptional rugby player. He was a Full-Back and winger, and played for Canterbury and the New Zealand Universities team. 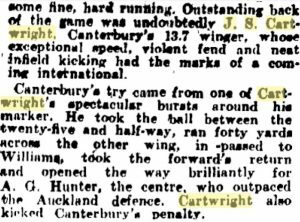 James scored over 150 points in one season and was given a trial with the All Blacks in 1939.Here’s a summary of one of his appearances in the local press. 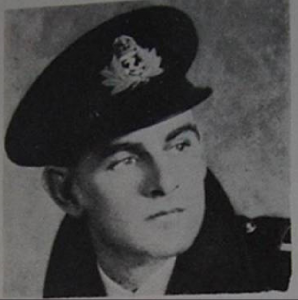 In June 1944, James was serving on board British destroyer HMS Boadicea as an Officer in the Royal New Zealand Navy, part of a crew of 172 men. 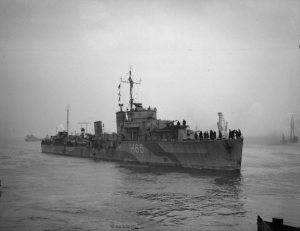 HMS Boadicea was one of more than five thousand ships and landing craft that crossed the Channel on 5-6 June 1944. James had served during D-Day and his parents had been informed that he had survived. But in the early hours of 13 June 1944, HMS Boadicea was returning to Britain from Normandy when she was attacked by German aircraft and hit by an aerial torpedo. HMS Boadicea was sunk and Lieutenant Cartwright was killed. 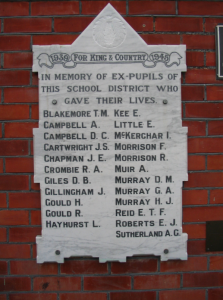 James is still remembered on a local memorial in Pleasant Point where he went to school. Lieutenant James Samuel Cartwright is currently commemorated on the New Zealand Naval Memorial, at the Devonport Naval Base, H.M.N.Z.S. Philomel, in Auckland. Lieutenant James Samuel Cartwright’s name will now be added to the British Normandy Memorial.